Many of you will have noticed the hoardings that were erected around St Joseph’s towards the end of last year. These were put in place for reasons of health and safety following the discovery that the cast iron crestings on the ridge of the church had be-come structurally unsound. Structural damage was also found at high level in the stone turrets, shown below, that flank the main entrance to the church. A programme of conservation works has been drawn up and tendered and repair works are due to commence shortly. One of the biggest challenges is providing safe access to work on the turrets and to remove the crestings for repair or replacement. To achieve this an enormous scaffold will be erected on the south side of the church. Taking advantage of this scaffold the fine cast iron gutters and downpipes will also be overhauled and the high level stained glass windows taken down and repaired as was completed last year on the north side of the church. 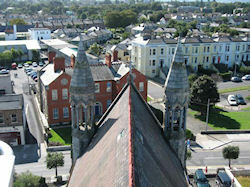 The cost of the work will be significant, however, it is all essential and Dun Laoghaire Rathdown County Council has offered a sum of €12,500 towards the work, which is a measure of the architectural importance of the church.